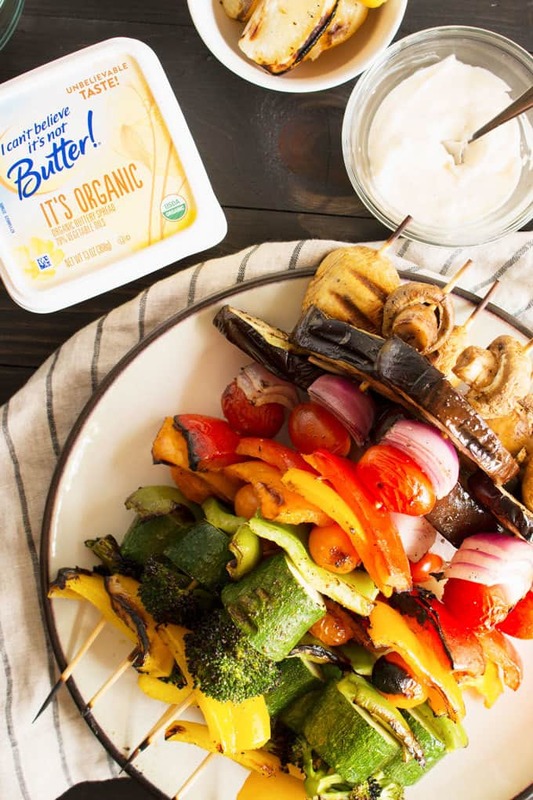 These Rainbow Veggie Kabobs are the perfect summer side dish! Serve them with my delicious and easy-to-make Grilled Lemon Garlic Sauce. This post is brought to you in sponsorship with I Can’t Believe It’s Not Butter! Thank you for supporting the brands that I love. All opinions are my own. I usually come up with my recipe ideas by walking up and down the aisles of the grocery store. It has something to do with all of the ingredients being at hand. My creative juices start flowing and my stomach starts rumbling. The other day I was walking around, brainstorming, when I noticed all of the bright colors in the produce section. It was like looking at a rainbow – bright bell peppers, purple eggplants, green lettuces and more. It was the ultimate summer inspiration; that’s how the idea for these rainbow veggie kabobs was born. First things first – pick out your vegetables. To prep the kabobs for the grill, I liberally brushed some I Can’t Believe It’s Not Butter! 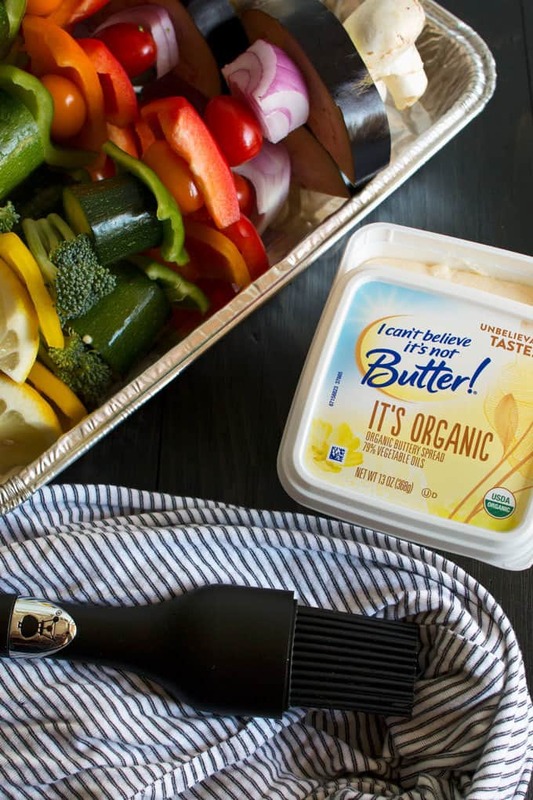 It’s Organic buttery spread on both sides of the vegetables. It’s Organic is made from real, simple ingredients like a blend of plant-based oils, purified water and a pinch of salt. It’s great for cooking, baking, and grilling! After coating each skewer with the softened It’s Organic buttery spread, I sprinkled salt and pepper on top and placed them in a foil pan. The pan is just for carrying convenience – you could use a plate as well. I heated the grill to medium heat and placed each skewer on the grate. 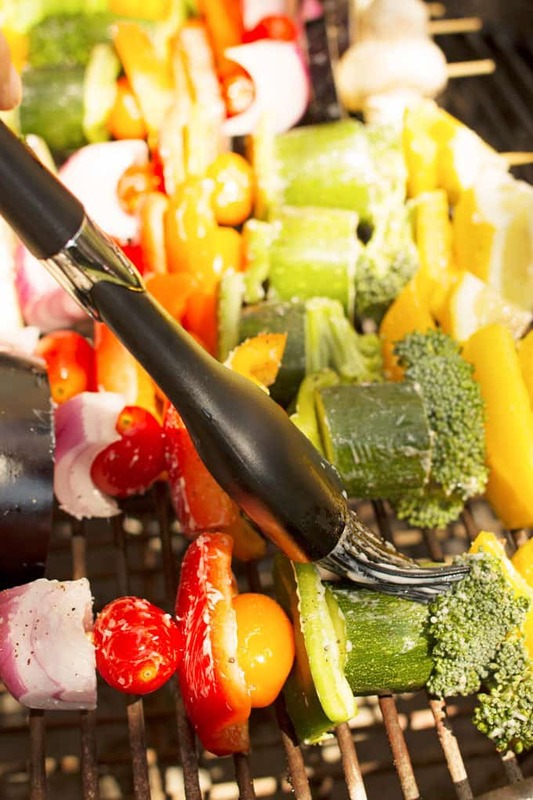 You should grill each side for 5-6 minutes – you will want a nice char on the veggies and for them to tenderize. I also kept a small ramekin of It’s Organic next to me along with my grill brush. I brushed more spread on top occasionally and let the melting spread drip onto the coals. It didn’t take long for the veggies to get crispy on the edges and to soften in the center. 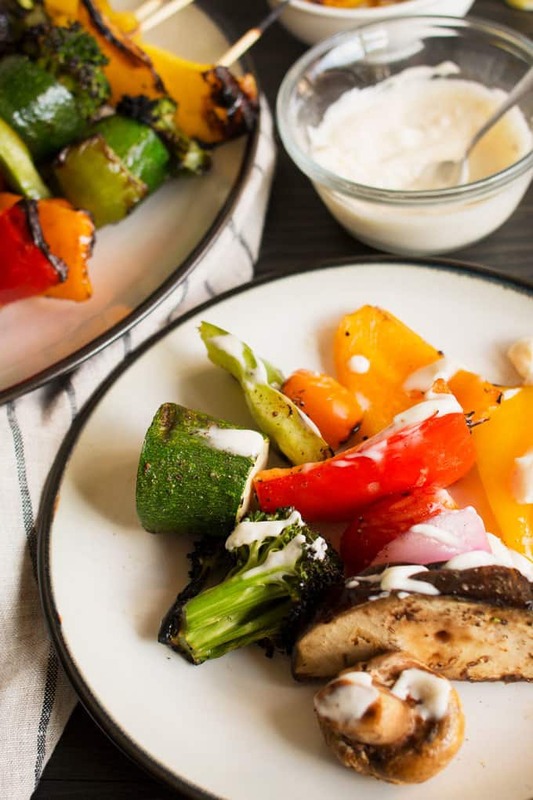 I like a good crunch with my grilled vegetables and you’ll definitely get that here! Once, you’ve reached the perfect temperature, the kabobs come off the grill the grill the skewers go and back into my foil pan. Time to make the sauce! Remember those grilled lemons we stuck on the end of the skewers? You can now remove them from each skewer and use them for the sauce! Lemon Garlic Sauce is super easy to make and grilling the lemons in advance adds a nice smokiness. All you have to do is soften some I Can’t Believe It’s Not Butter! It’s Organic spread, mince some garlic, and squeeze your grilled lemons. Add a little salt and pepper and you have the perfect dipping sauce for your grilled veggie kabobs! Want to know something else that’s great about this recipe? 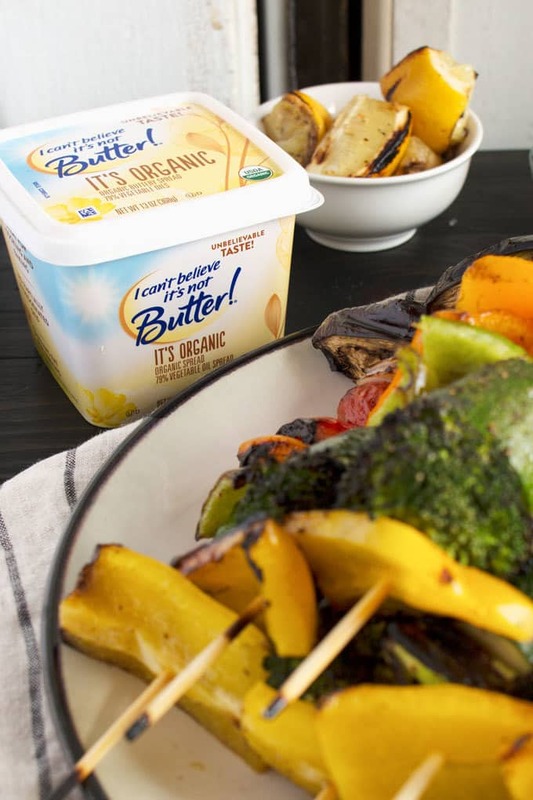 You can make it completely vegan by substituting I Can’t Believe It’s Not Butter! It’s Vegan! 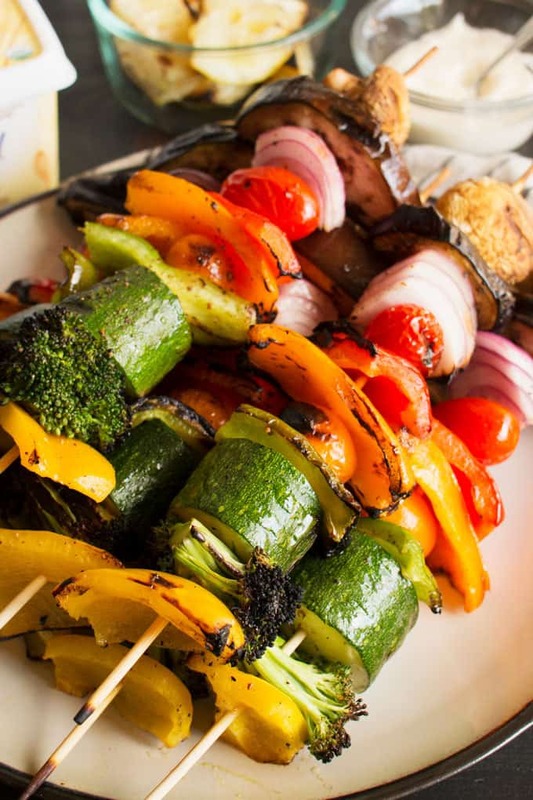 These rainbow veggie kabobs are the perfect summer side dish! Serve them with my delicious and easy to make grilled lemon garlic sauce. 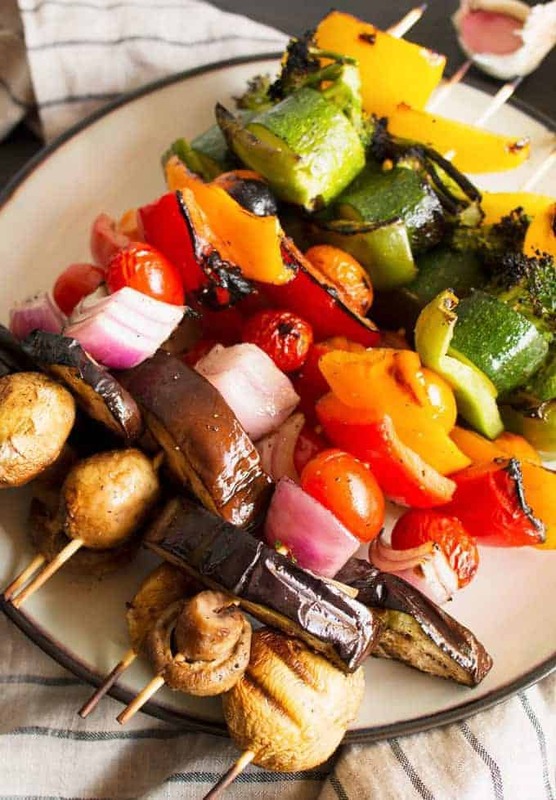 Prepare 8 skewers by adding the vegetables in the following order: cremini mushroom, eggplant, red onion, cherry tomato, red bell pepper, orange bell pepper, cherry tomato, green bell pepper, zucchini, broccoli, and yellow bell pepper. Liberally apply the I Can't Believe It's Not Butter! It's Organic spread using a brush on both sides of the vegetable skewers. Sprinkle with salt and pepper. 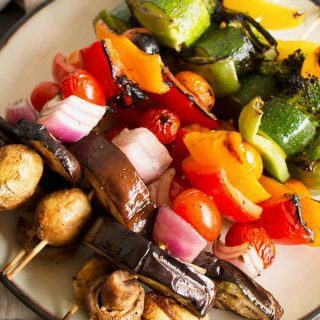 Place the skewers on the grill, grilling each side for 5-6 minutes, until the vegetables are crispy on the outsides and tender in the middle. Remove the skewers from the grill and serve. To make the Grilled Lemon Garlic Sauce, remove the grilled lemon wedges from the skewers. Soften 3 tablespoons of I Can't Believe It's Not Butter! It's Organic spread in a small bowl. Squeeze the lemon juice into the bowl and add the minced garlic. Whisk until well-combined. Add salt and pepper to taste. Follow I Can’t Believe It’s Not Butter! on social media! Even my picky kiddo would approve of this! Yum! This is seriously so so gorgeous! The colors are popping so bright. Those look soooo good! I love any excuse to crank up the grill! Love the rainbow of colors in these kabobs! These are a great addition to our end of summer bbq! Love that grilled lemon garlic sauce on these! Have to try it! Such a colourful and easy way to make sure we have our daily veggie requirement. Thanks for linking up and sharing with us at #overthemoon link party. looks so delicious!! cant wait to try it! Your post is featured on Full Plate Thursday this week. We have pinned it to our Features board and thank you so much for sharing with us. Enjoy your weekend and your new Red Plate! my husband love kebab. it such a colorful recipe. It looks fantastic and I hope the taste of this awesome.